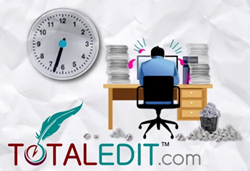 On July 31, 2014, at 7:00 pm MST, academic editing service TotalEdit.com will host the first in a series of webinars focused on self-publishing. The guest at this first webinar will be successful self-published author and digital marketing professional Jason Drohn. On July 31, 2014, at 7:00 pm MST academic editing service TotalEdit.com will host a webinar featuring self-published author Jason Drohn. In the information age, self-publishing has become easier than ever, yet many authors still struggle to become successful. In this special exclusive webinar with Jason Drohn, Drohn will tell the story of how he made self-publishing not only possible, but profitable as well. Jason Drohn is an American marketing expert from Erie, PA, an author, and an entrepreneur. Drohn successfully built a powerful business with digital marketing and now consults both major companies and home-based business owners all over the world. Thousands of people have benefited from Jason's digital training and coaching programs such as MoneySites.com and Leveling Up Marketing. Jason is widely respected for his sincerity and his easy-going personality which balance perfectly with his sharp business skills. Registration for the webinar is free to the public and is available here: https://totaledit.leadpages.net/self-publishing-success/.